Extend your brand image by adding your own logo to full-color notepads. Makes a great promotional item! Bargain Printing uses top quality offset printing on 70 lb. premium stationery paper. Available in multiple sizes and page counts. People still keep notepads by the phone. Shouldn’t they be keeping your notepad by the phone? It pays to keep notepads on the counter where customers can pick them up and take them home. Your name, your logo, your important information will be on every sheet. Marketing in an online world is a challenge, trying to strike that balance between the electronic message and what’s on paper. But with notepads, you can offer your regular customers a promotion that will last. And every time they reach for a slip of paper to make a note, they will see your logo, your address, your phone number, and your message. 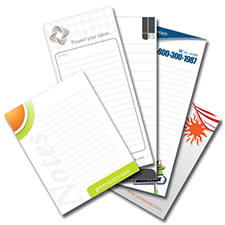 Consider promotional notepads as a convenient way for you to let your customers to know that they are important. You give them a convenient way to remember you - and be reminded of your phone number too. 4.25" x 5.5" 4" x 6" 8.5" x 3.5" 8.5" x 5.5" 8.5" x 11"